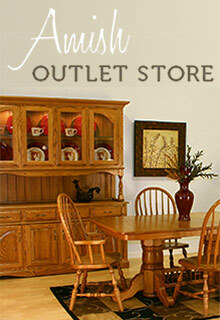 Fill your home with solid wood Amish made furniture pieces that are expertly handcrafted by the finest Amish crafters. Discover handmade Shaker and Mission furniture designs that are produced using only the highest quality woods and materials featured at amazing discount prices, only from the Amish Outlet Store. Receive an additional 3% off by telling us in the check-out comments section that you found us on Catalogs.com! Check out the home page for additional discounts. Living & Dining Room - Make your living room the perfect place to relax and gather together with solid wood framed sofas and futons, chairs, coffee tables, fireplaces, curios and display cases that will house all of your most precious keepsakes and knick knacks. Dine in splendor with handsome Amish dining room furniture featuring dining tables, benches, hall seats and sets that will incorporate a classic look into any dining area. Entertain with barstools, servers and sideboards that will accommodate and welcome friends, family and guests. Add extra storage space to your kitchen with hutches, kitchen islands, pie safes, jelly cupboards, and more kitchen and dining extras that will add beauty and functionality to your home. Bedroom & Bath - Allow the Amish Outlet Store to furnish your master bedroom with the perfect centerpiece, featuring beautiful Mission and Shaker style bedroom collections and sets that include deluxe beds, mirrored dressers and matching nightstands offered in a variety of contemporary designs. Browse over 51 contemporary designs by set or shop for a singular piece with beds, nightstands, jewelry chests and dressing tables available to add vintage charm to your bedroom or sitting room. Bring the Mission and Shaker style into your bathroom with the perfect single or double bathroom vanity that will add storage and sophistication to your master or guest bath. Entertainment & Accents - In addition to their living room, bedroom and Amish dining room furniture sets, you can also explore elegant options for housing your television, stereo, speakers and sound equipment with the right solution to cover all of your home entertainment needs. Choose from a distinctive selection of entertainment centers, stereo, home theater and media cabinets, as well as handcrafted game room furniture, pool and poker tables that are essentials for any game night. Add the perfect accent furnishings to every corner with accent tables, clocks, bookcases, chests, wine cabinets, and other heirloom quality pieces that will stand the test of time. Kids & Office - Invest in traditional Amish made furniture for your nursery or childrens' rooms with beautiful handcrafted cribs, cradles, changing tables, rocking chairs, toy boxes, bunk beds, high chairs and chests suitable for little ones of all ages. Supplement your workspace with spacious desks and coordinating desk chairs, file cabinets, computer centers and bookcases that will help you get the job done with comfort and style. Whether you favor red or white oak, cherry wood, maple, walnut or hickory, the Amish Outlet Store is your source for sturdy, strong and durable solid wood furniture pieces that are designed to last and be passed down for generations.